In mid-June I spent a week working a at a location farther north than I had ever been – Lac de Gras, 220 km south of the Arctic Circle in the Northwest Territories. 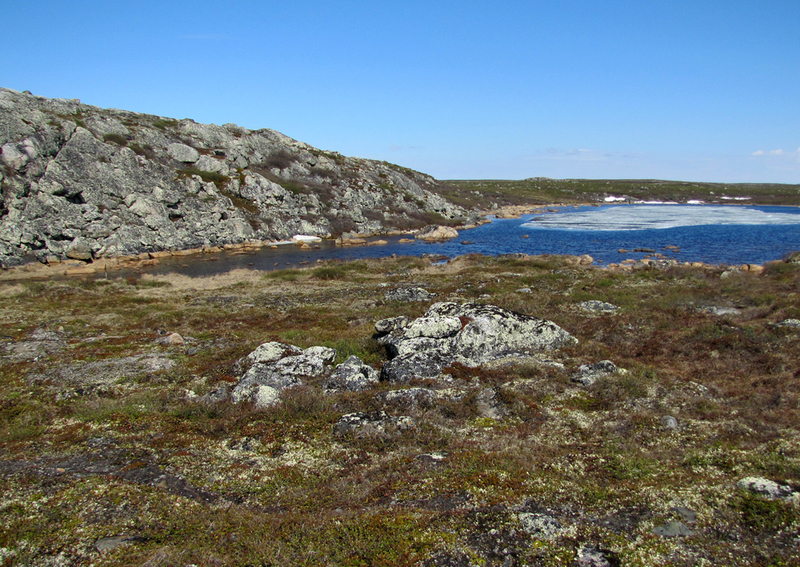 On an island in Lac de Gras is Diavik Diamond Mine. 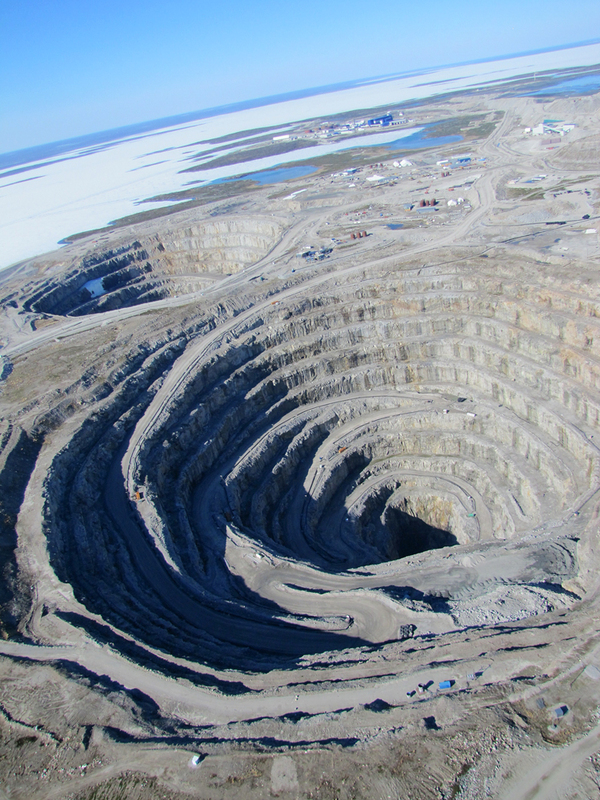 Diavik employs about 1000 people to mine and process diamonds and to support the mining operations. The cafeteria is stupendous but the sleeping quarters are not particularly salubrious. It is a dangerous place due to gigantic vehicles, rockfalls, extreme weather and large mammals including caribou and grizzly bears. At Diavik, people are very very safety-conscious. They have made some rather large holes in this island. Diavik mining pits as seen from helicopter. 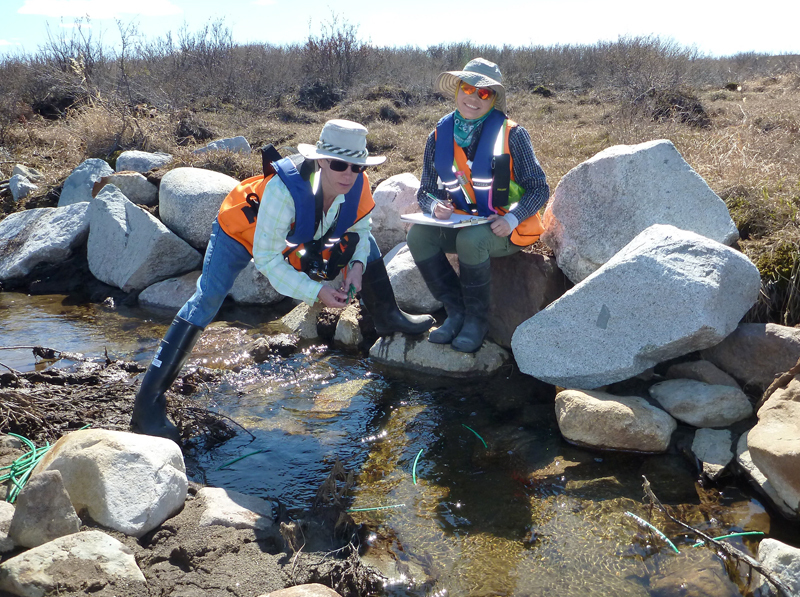 To compensate, in part, for their impact on the local environment, Diavik is supporting a number of research and remediation projects on and near the mine, including studies on soil and plants, and on stream fauna. I am involved in the latter via my M.Sc. student Christiane Uherek, whom I cosupervise with Bill Tonn, a fish ecologist in my department. Bill and a half dozen of his students have worked hard over the past several years to create and monitor an artificial stream connecting a previously isolated lake on an island near the mine site with Lac de Gras. The hope is that grayling and other fishes will use this stream to access the lake for breeding. Christiane isn’t working on the fish directly, but rather on the artificial stream’s physical and biological characteristics. She will compare these features with those of nearby natural streams (references) to determine whether flow, woody debris and invertebrate assemblages of the artificial one fall within the range of variation of natural ones. It’s the macroinvertebrates that connect me to this project. Reference 6 Lake, from which Ref 6 Stream 1 flows. To measure retention of organic matter we tossed artificial sticks and paper ‘leaves’ into streams and measured how far they went downstream before they got stuck. Me dropping artificial sticks into an artificial stream, with Christiane recording data. Terrestrial vertebrates (in addition to humans) are surprisingly common at Lac de Gras. Voles, ground squirrels and willow ptarmigan regularly dropped by to check out what we were doing. 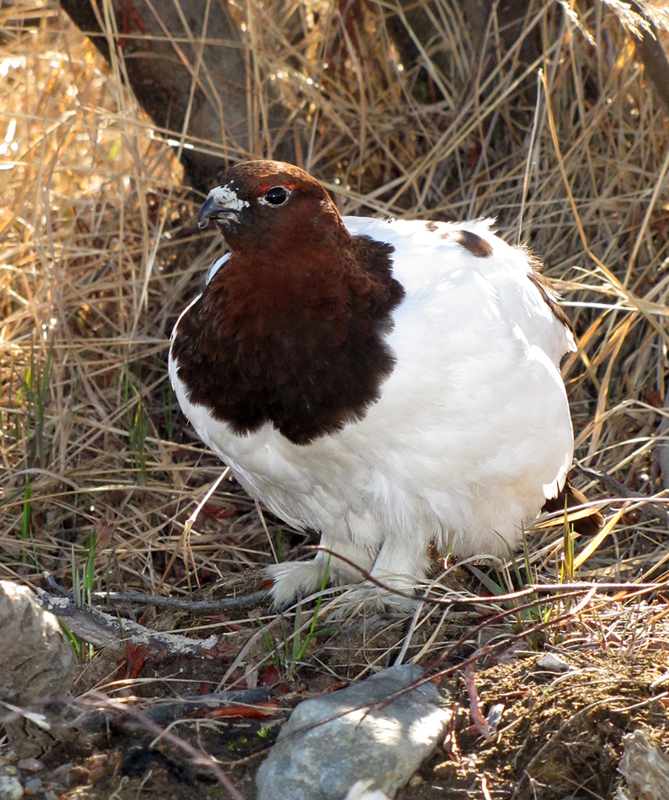 Male willow ptarmigan wondering why we are measuring sticks. According to the New Shorter Oxford, ‘ptarmigan’ is a falsely Greekified modification of the original Gaelic name ‘tarmachan’, which means ‘grumbling or croaking’; apt if you listen to the bird’s rather frog-like calls. During my week there I came to understand why Diavik emphasizes safety with such religious fervour. We experienced lightning storms, rockfall alerts, a vehicle that burst into flames in front of our truck, and a couple of grizzly bears, one of which we escorted with the help of a helicopter from the mine site, across frozen Lac de Gras, to the mainland. 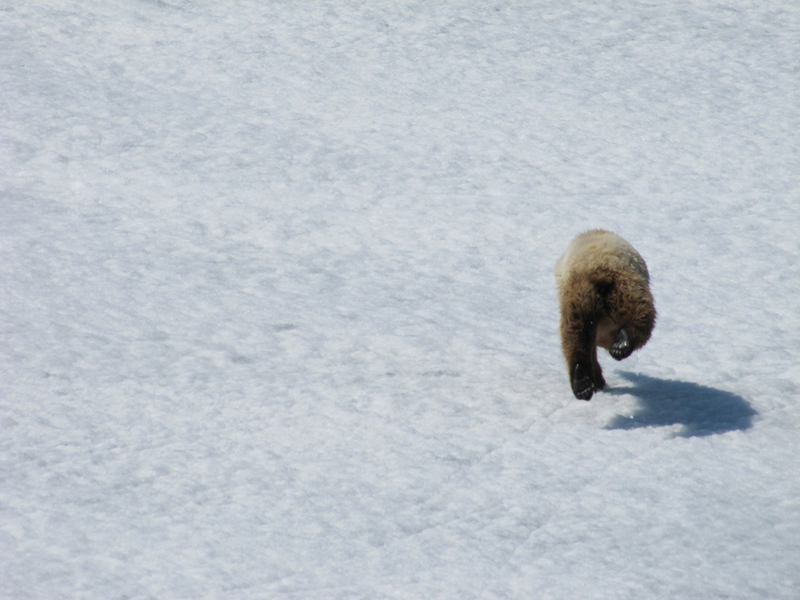 Note to self: grizzly bears can run very fast for a very long time. Fear them.